The international community is concerned about the North Korean missile and nuclear tests and the threat of an additional nuclear test. Why does North Korea continue to provoke the international community? One of the reasons is the country’s domestic situation, in particular the economic problems it is facing. North Korea is in financial trouble. Since North Korea doesn’t release its statistical data, one cannot directly assess its current economic situation. But market prices, especially the price of rice, could always be a good indicator of its economic situation. 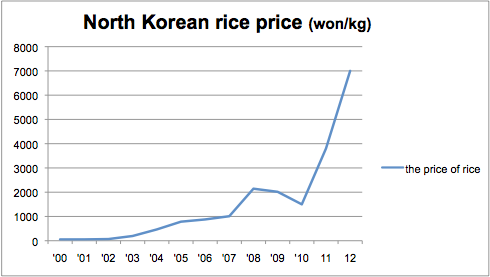 After 2000, the price of rice in North Korea increased steadily. Especially in 2005, 2008, and 2011, the price of rice soared, compared to the previous year. The North Korean government set the official salary in July 2002, when a new economic policy was established, and the same wage scale is maintained now. In 2002, the minimum monthly wage was 1000 won, and the price of rice was 50~60 won per kilogram. A North Korean could buy 20kg of rice with their monthly wage at that time. However, North Koreans now can buy only 150g of rice with the current actual minimum monthly wage. Of course, the situation of those who receive rations is better, but the number of people who receive rations continues to decrease. Although North Koreans don’t live solely on their government salaries, a decrease in their actual purchasing power means that the North Korean government’s control of the people is diminished. The socialist system can control people when the government is solely in charge of their livelihoods. The less the government guarantees the living standards of its people, the weaker its control is. To make up for this, North Korean authorities have attempted to re-emphasize the visibility and importance of the government by celebrating the contributions of nuclear scientists and other technical experts after the missile and nuclear tests, through public events in open squares or lectures. At the same time, they have tightened border and information controls. The North Korean authorities claim the economic depression is the result of sanctions imposed by the United States. This further narrows and impairs their thinking. Consequently, they tend to place more emphasis on outside factors (such as the sanctions), thus failing to grasp the critical impact of domestic factors. During the past three years, the North Korean government has tried hard, but failed to attract significant foreign investment. One can only hope that, because of such failures, the government can now better understand the determining factors of its current conundrum. North Korea provokes South Korea or surrounding countries when its economic situation gets worse. All provocations, including North Korea’s proclaiming itself a nuclear state in 2005, missile and nuclear tests in 2009, the sinking of the ROKS Cheonan and the shelling of Yeonpyeong Island in 2010, the 2012 missile test, and the recent missile and nuclear tests occurred when the North Korean economic situation was bad. Recent provocations are somewhat due to the personality of young leader Kim Jong-un, but North Korea’s economic depression continues to be one of the fundamental causes of such provocations. It seems odd, but North Korean provocations conducted against South Korea may signal that it wants to receive economic support, and the missile and nuclear tests may be North Korea’s way of indicating that it wants the United States to lift economic sanctions. North Korea has realized that it can receive economic support and gain diplomatic concessions only through brazen provocations, such as nuclear tests. The North Korean regime will continue to see its nuclear capabilities as its ultimate means of survival, and will thus be unwilling to give up its nukes. The international community argues that there is no way to solve the nuclear issue in North Korea. However, either a military or a peaceful way does exist. The only problem is that the cost is high, and nobody is willing to shoulder that cost. Therefore, the international community has always delayed the problem-solving process whenever it was faced with North Korean provocations; instead, it has relied on temporary solutions. Meanwhile, missile and nuclear capabilities in North Korea have grown, and the cost of these provocations has increased as well. One wonders, what is the actual cost of North Korea’s nuclear weapon development program?